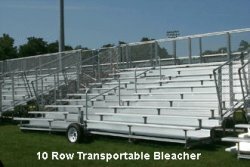 The economical alternative to lack of spectator seating is a transportable bleacher set from BuiltRiteBleachers.com. Share one bleacher set with multiple sports fields. 5 Row - 21'L -Transportable w/Single Footplank- Seats 70 - Weight 1556lbs.